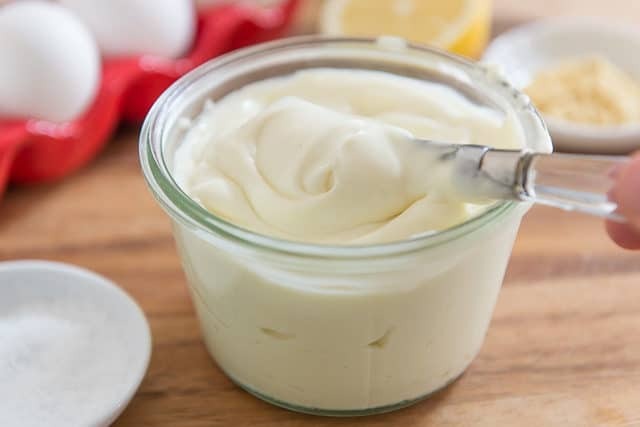 Mayonnaise Recipe - Takes less than 10 minutes to make! 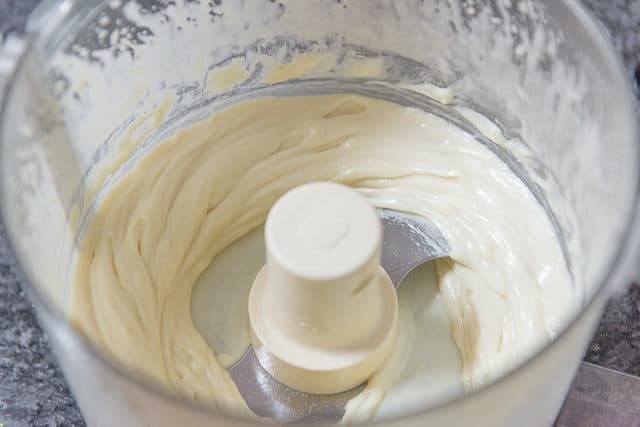 Mayonnaise takes less than 10 minutes to make at home, and it tastes SO much better than most of the brands at the store. Fresh is definitely better when it comes to mayo, and you only need 5 ingredients! Why make mayonnaise at home when you can buy it at the store? This is a valid question, especially when the convenience factor is strong. Mayonnaise is only something I started making at home last September, during my Whole30. Anyone who has done the program knows why: it’s just about impossible to find a store-bought brand of mayonnaise that doesn’t have added sugar AND is made with a healthy oil. So the only solution was to start making it myself. I had made the occasional homemade aioli or mayonnaise in the past, but this time the regularity of it stuck. 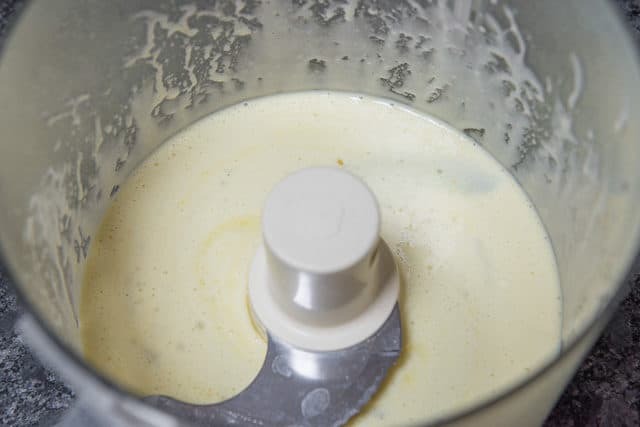 Mayonnaise is incredibly easy to make, so it’s one of those things where if you care enough about the flavor and health factor, making it yourself becomes worthwhile. 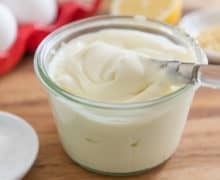 Even if you’re not a fan of mayonnaise as a condiment, there’s a good chance that you like a lot of the foods where mayonnaise plays an important role, whether it’s chicken salad, the best egg salad, deviled eggs, or homemade blue cheese dip. The deliciousness of the mayonnaise you’re using can totally make or break those kinds of recipes. I know because I tried to use up that one terrible avocado oil mayonnaise I had bought and “hide” it in egg salad with lots of fresh dill and celery. But nope, the flavor of the mayonnaise was still glaring. Which makes sense, right? It’s an essential flavor in those kinds of salads. What’s the best oil to use for mayonnaise? When I say to use a “neutral oil,” I mean one that is neutral in flavor. My personal favorite for mayonnaise is olive oil, but make sure it’s NOT extra virgin. Extra virgin olive oil turns bitter in the food processor and blender, and the flavor is too strong anyway. You want to look for the regular or “light” olive oil. Another good oil for mayonnaise is sunflower oil, which has an agreeable flavor. One oil that I don’t recommend is avocado oil. While it is a healthy oil, I find the flavor to be terrible. But I know this is a personal preference! I want to comment for a moment on the egg situation. The egg in this recipe is indeed raw, and personally I have been eating raw eggs (in mayonnaise, nibbles of cookie dough, etc) for years without issue. If you Google ‘how many eggs have salmonella,’ you will see articles (like this one from Slate) that discuss this risk, and it’s estimated that about 1 in 20,000 eggs has salmonella. That number is small enough that I just go ahead and eat raw eggs when the situation comes up. However, if you prefer, you can purchase pasteurized eggs to use for homemade mayonnaise, or you can even pasteurize them yourself. I’ve seen lots of tutorials online for that. I’ve also seen some people say online that if you leave the mayonnaise at room temperature for an hour or two before refrigerating, the lemon juice will kill off the bacteria, but I’m personally skeptical that that’s true. I think it’d be better to use pasteurized eggs in that case. The liquid will be quite thin. You want to do this pretty slowly, over the course of about 60-90 seconds. This makes the mayonnaise creamier and thicker. Blitz in a couple tablespoons of fresh lemon juice, and it’s done! You can also use vinegar, but I find the flavor of fresh lemon to be better. Store the mayonnaise in the refrigerator for up to 4 days. Enjoy! Do I have to store mayonnaise in the refrigerator? Yes, store in the fridge for up to 4 days. Can you freeze mayonnaise? Not recommended. The emulsion will likely break, and when you thaw it out, it will have a chunky texture. Some of my favorite uses for mayonnaise: Honey Walnut Shrimp, Smoked Salmon Deviled Eggs, and Jalapeño Cilantro Sauce. Can mayonnaise make you sick? As I discuss above, it is estimated by the CDC that 1 in 20,000 eggs have salmonella, so the odds in my opinion are very low. If desired, use pasteurized eggs. Dietary restrictions: This mayonnaise is gluten-free, dairy-free, paleo, and Whole30 compliant. 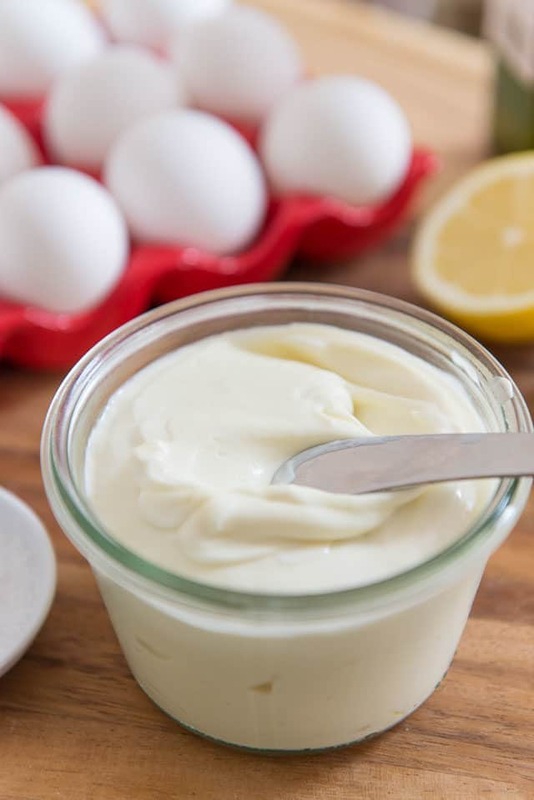 This Homemade Mayonnaise takes less than 10 minutes to make, and it tastes SO much better than most of the brands at the store. Fresh is definitely better when it comes to mayonnaise, and you only need 5 ingredients! 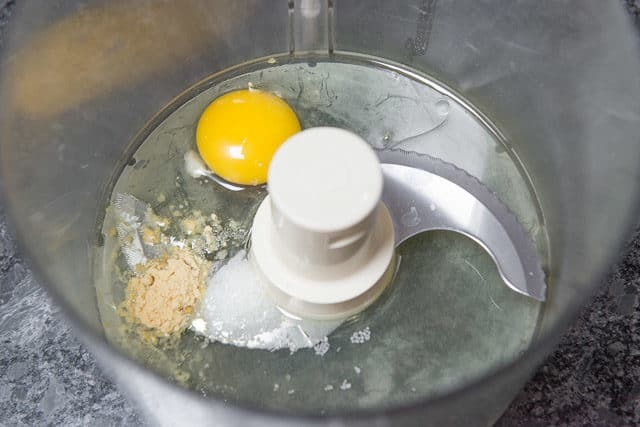 Place ¼ cup of oil in a food processor, and add the egg, ground mustard, and salt. Process thoroughly, for about 30 seconds, until combined and pale yellow in color. 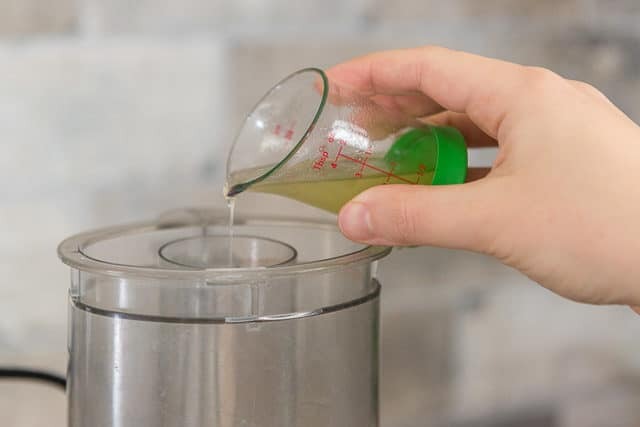 With the blender running, slowly drizzle in the remaining oil until the mixture is emulsified and thick. Adding the oil slowly makes for a creamier mayonnaise. The total pouring time to aim for should be 60-90 seconds. With the food processor still running, add the lemon juice, and mix briefly, for only about 5-10 seconds, until incorporated. The mayonnaise is now ready to be used. Enjoy! Store in the refrigerator for up to 4 days. *Try to remember to pull an egg out an hour or two before making the recipe. If you forget, you can put the egg in a glass of warm water for about 10 minutes instead. **You can use any neutral oil you'd like here. I like a light olive oil as my first choice, as well as sunflower oil. Avocado oil is trendy because it's healthy, but I find the taste to be terrible and don't recommend it. Make sure not to use extra virgin olive oil here, because it will make the mayonnaise bitter and the flavor is too strong. 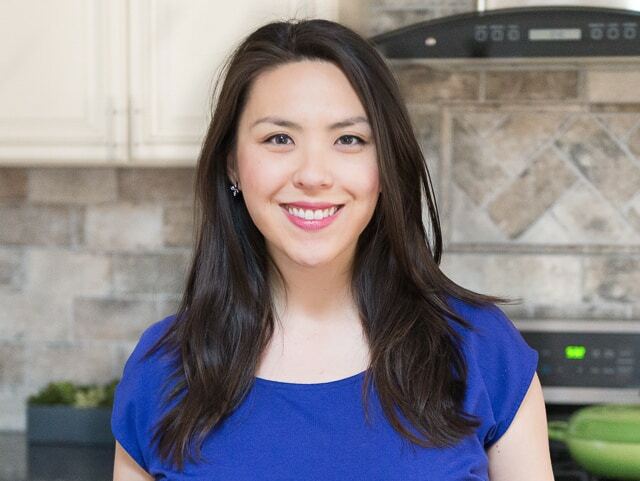 Recipe adapted from the Whole30 method in It Starts with Food. This makes about 1.5 to 1.75 cups of mayonnaise. Disclaimer: consume raw egg at your own risk. Some of the information and raw egg statistics in this post may be out of date. Great! Used grape seed oil to make a curry mayo with this recipe. This will be a staple. Thanks! What’s the brand? I’ve tried two brands and find the flavor to be pretty strong, and one I dislike. But if you like the one you’ve got, by all means go ahead. It will work great. I wonder if it’s like the cilantro thing where not everyone tastes it? The avocado oils I’ve tried were pretty tasteless too. It may also be a reaction with what it’s being used in or mixed in to.